A weekly, short course yoga program for people getting married in Winter/Spring 2019, designed just for you and practiced in your home. Available on Tuesday evenings from the 1st May through to the 12th June. Often during the frenetic pre wedding phase, it's great to take the chance to chill out and connect with your self and your partner. Perhaps you will invite Bridesmaids, Groomsmen or parents for one or two sessions, or dive deep into your own peaceful state so that you are ready for the big day. Programs on offer include a 6 week Chakra Journey, 5 week Elemental Adventure and 4 week Bhakti Bliss Experience. A weekly, short course yoga program, designed just for you and bought to your home. Available on Tuesday evenings from the 5th March through to the 2nd April. The perfect Hens, Grooms or gift to each other. In the frenetic pre wedding phase, this practice gives you time to chill out and connect with your self and your partner. Perhaps you will invite Bridesmaids, Groomsmen or parents for one or two sessions, or dive deep into your own peaceful state so that you are ready for the big day. Programs on offer include a 6 week Chakra Journey, 5 week Elemental Adventure and 4 week Bhakti Bliss Experience. Introducing a fun yoga course for our school aged kids at Lotus Bay Yoga with Young Yoga’s Alysse. Build resilience for the big adventures our little people have, with a yoga class just for school aged kids. Siblings are encouraged to practice side by side on the mat. For more information please call Amy Weidlich on 0425332490 or come along on any of the Saturday afternoons and give it a go, throughout March. We invite you to bring along a special person who is going to be by your side during the birth of your new bub. 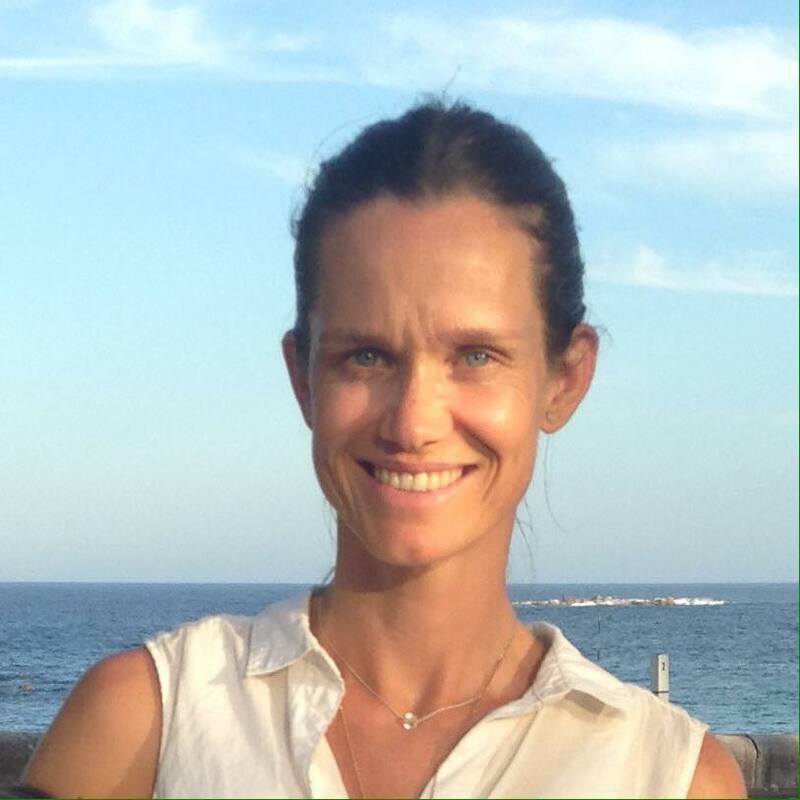 Our mid-wife yoga teacher Veronica Hegedus will run a Q&A and offer some yoga movements for birth, during our usual Monday evening class time. It’s a lovely way for birth partners to feel connected to your Monday night yoga ritual. If your dear birth partner is unable to make it we encourage you to come along, taking the chance to meet new friends and have fun asking all the questions that come to your mind. A weekly, short course yoga program for people getting married in Summer 2018/2019, designed just for you and practiced in your home. Available on Tuesday evenings from the 2nd October through to the 21st November 2018. During the often frenetic pre wedding phase, it's great to take the chance to chill out and connect with your self and your partner. Dive deep into your own peaceful state so that you are ready for the big day this summer. Programs on offer include a 6 week Chakra Journey, 5 week Elemental Adventure and 4 week Bhakti Bliss Experience. Five times a year thousands of women around the world come together to do something extraordinary - to share love, light and healing, and to awaken the Sacred Feminine within themselves and within the world through a World Wide Womb Blessing. 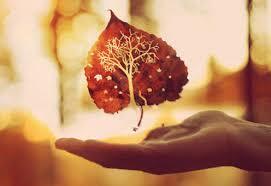 A Womb Blessing is an energy process to restore authentic feminine energy. It's a return back to the original pattern of female energies, exploring female authenticity, creativity, and spirituality. Through adaptation to society we loose contact and disconnect with the 4 female archetypes whom all woman consist of, The Maiden, The Mother, The Enchantress and The Crone, and move away from their energies. A Womb Blessing awakens these dormant energetic archetypes and raises the vibration of the Divine Feminine. It teaches us who we are as authentic woman, changing our awareness and strengthening our connection to the feminine. It energizes the female womb centre, the life mother, and helps centre, balance and root us to mother Earth. Thank you! We can’t wait to see you at 7.45pm on Sunday 26th August 2018! Be prompt as we’ll be full swing in ritual for the 8pm full moon moment. If you have any questions contact Bjorg-Ida on 0402028801. 1. Go to www.wombblessing.com to register for the World Wide Womb Blessing. When you come to the Womb Blessing Time, tick 12.00pm UK time, which will be 8.00pm Sydney time. You need to do this before 8pm Saturday 25/08 before international registration closes. 2. Once you've registered, Your Registration Confirmation Page contains a link to download documents with instructions and meditations - www.wombblessing.com/wb.html. Read through the information if you are new to the Womb Blessing, it will help you prepare to receive the healing energy of the Blessing. When you receive the Womb Blessing, a 28 day period of 'rebirth' takes place, where the energy continues to heal, energize and release old and unwanted patterns. These may be physical, emotional or spiritual. It has a detox effect that will last 2-3 days at most, and drinking lots of water with a dash of lemon juice will aid this process. Tiredness you may feel after is the integration of the changes in energy. Please be gentle with yourself, eat and drink healthily and do the Self-Healing Exercise every day for 5-10 minutes. First Up - From a Hawaiian Tradition to Longboard Carving - we explore the sport of Kings and Queens, when it was always, all about the joy. A very act of communing with nature and being in flow. We track the art of surfing from it's Hawaiian heritage to it's Australian shores when Isabel Letham was Australia's first surfer as she rode tandem with Duke Kahanamoku at Manly Beach. We track surfings adventure to long boards, big waves and the beginnings of a world competition and the promise of the Endless Summer. Our yoga will be a gentle flow, a playful exploration of our mats/boards and a connection with the natural rhythms of our body, through the ebb and flow of the breath. 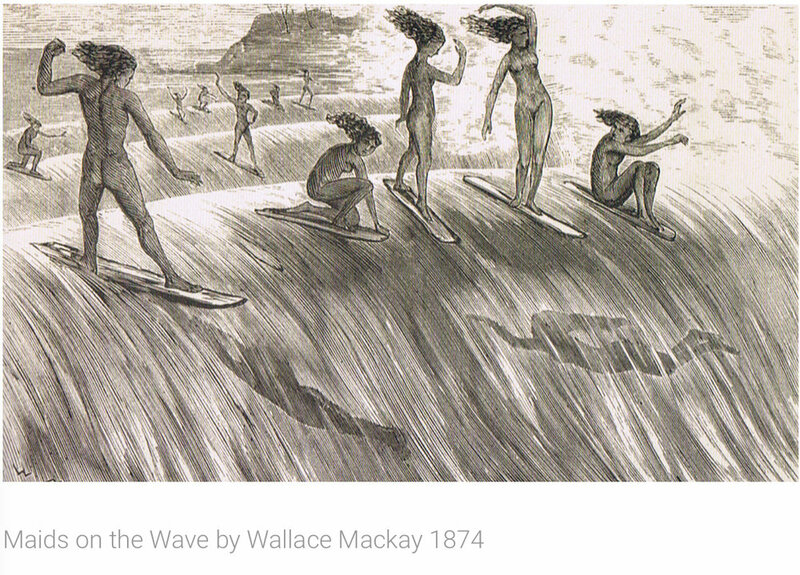 Maids on the Wave by Wallace Mackay, 1874 - Join Lotus Bay Yoga for a three part yoga series paying tribute to the history of surfing. Secondly - Short Board Revolution - From Tom Carrol to Kelly Slater, Shaun Thompson to Tom Curren, Mick Fanning WOW and trail blazer Layne Beachley. In this yoga practice we get a fire in our belly to be be the best we can be. We learn that it's not just about being the water, it's about attending to our craft, to keep paddling out. To train our whole bodies and when we lose our way - evolve that to training our minds and caring for our souls too as we fire up to keep on THE SEARCH. We fall off and then we paddle back out to push the outer limits of what's possible in this soulful sport. Our yoga will be dynamic, in avid flow, we'll twist and turn our manipura chakra and check if our ego is over or undercharged. Week 2 Yoga Practice we dig the short board revolution and fire it up with a passionate yoga practice as we see the rise of professional athleticism is surfing, at Lotus Bay Yoga. Finally - Anything Goes - as we return to soul surfing & big wave riding! Whole families of Surfers choose the boards of their choice. The new superstars are polymath riders like Kai Lenny who are good at everything and choose the board that suits the conditions and their pursuit of joy! Families take turns riding soft fun boards, getting out the back on the SUP and we see the re-prise of windsurfing. Tom Wegeners balsa slide boards take it right back to the start - honouring the original Hawaiian designs. It's now that the longboard revolution is well and truly returned - with it's own world tour; while short board riders are re-exploring shapes like the fish - playing with their fin set ups and charging like never before with an athleticism to be admired! For our yoga practice we notice how we can choose the modality or practice that suits our bodies and we learn from mixing it up on our yoga mats, as well as in the water! The Paradigm has well and truly been lost. Anything goes and soul surfing is where it's at, join @amyariel of Lotus Bay Yoga at Driftwood Living in the heart of Little Bay Village in Sydney's Eastern Suburbs for a three part surfing progression yoga practice. Visit here to buy your three practice pass, or just pick up any of our class packs of 4 or 10 classes and sign in to the class. You can also buy one offs and simply come along to the practice you can make it to. A weekly, short course yoga program for people getting married in Spring 2018, designed just for you and practiced in your home. Available on Tuesday evenings from the 24th July through to the 21st August. Programs on offer include a 6 week Chakra Journey, 5 week Elemental Adventure and 4 week Bhakti Bliss Experience. Often during the frenetic pre wedding phase, it's great to take the chance to chill out and connect with your self and your partner. Perhaps you will invite Bridesmaids, Groomsmen or parents for one or two sessions, or instead take the time to dive deeper into your own peace. Three Saturdays in May, three yoga classes - EAT PRAY LOVE. Inspired by Elizabeth Gilbert's much loved modern classic Eat Pray Love, our Saturday morning yoga practice at Driftwood Living in May, is going to be inspired by the heart felt experiences of her travels across Italy, India and Indonesia. This fun yoga practice is lead by Lotus Bay Yoga's founding teacher Amy Weidlich who can't believe it's been over 10 years since this book was first published! Click on the image above to purchase your three class pass for $45, which includes three classes and a coffee! Or navigate across to Pre-Pay Class and purchase a one off if you can only make one of the three Saturdays. While we are on the mat, we will be able to reflect on our own journeys of the soul. The yoga will be a combination of gentle flows with some more contemplative holds, designed for all levels of yoga experience. The main thing is that this search on the mat will be nourishing and offer food for thought and gifts for the soul. Following practice, yogis will be delivered their choice of beverage from local cafe Piccola Baia who delivers their share of La Dolce Vita philosophy to Little Bay most days. Together we'll chat about our perspectives on Eat Pray Love, share travel stories and just sit in the sun together. Here is a link to the free kindle sample of the 10th anniversary edition of Eat Pray Love - for those of you who want to read along. A weekly, short course yoga program for people getting married in Winter 2018, designed just for you and practiced in your home. Available on Tuesday evenings from the 1st May through to the 12th June. Often during the frenetic pre wedding phase, it's great to take the chance to chill out and connect with your self and your partner. Perhaps you will invite Bridesmaids, Groomsmen or parents for one or two sessions, or dive deep into your own peaceful state so that you are ready for the big day. Programs on offer include a 6 week Chakra Journey, 5 week Elemental Adventure and 4 week Bhakti Bliss Experience. A weekly, short course yoga program, designed just for you and bought to your home. Available on Tuesday evenings from the 27th March through to the 24th April. The perfect Hens, Grooms or gift to each other. In the frenetic pre wedding phase, this practice gives you time to chill out and connect with your self and your partner. Perhaps you will invite Bridesmaids, Groomsmen or parents for one or two sessions, or dive deep into your own peaceful state so that you are ready for the big day. Programs on offer include a 6 week Chakra Journey, 5 week Elemental Adventure and 4 week Bhakti Bliss Experience. Join us at Driftwood Living in the heart of Little Bay Village for a heart warming yoga practice. Purchase one off classes or a 6 week pass. We're donating 5% to charity and looking forward to starting the year with all the glow of summer. Head on over to our 'Pre-Pay Class' section in the main menu to sign up. Join Amy Weidlich for a calming Christmas yoga practice at Driftwood Living in Little Bay. Bring your yoga mat, a large beach towel and an eye bag for a nourishing 1 hour vinyasa flow practice. Return: Driftwood Living will host herbal tea and in store discounts for participants. Register: Please contact amy@lotusbayyoga.com or call 0425332490 to register as places are limited. Confirm: Go to Pre-Pay Class to confirm your place.